Neuroma pain is classically described as a burning pain in the forefoot. It can also be felt as an aching or shooting pain in the forefoot, and numbness or tingling into the toes. Burning radiating from the joints and into the toes is also sometimes felt. The source of this pain is an enlargement of the sheath of an intermetatarsal nerve in the foot. 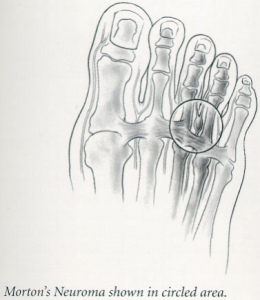 This usually occurs in the third intermetatarsal space as the nerve branches out to the toes and is slightly thicker. Tight footwear is commonly a fault but most often abnormal mechanical forces such as excessive pronation can cause the metatarsal heads to rotate slightly and pinch the nerve that runs between them. The aim is to reduce any mechanical causes of the nerve irritation with supportive footwear and orthotics. This can be casted orthotics, or simple insoles to recreate the transverse arch and spread the metatarsals using a foam dome behind the joints. Surgical Removal of Neuroma is an option if it is severe.